I see that you've been covering the food + tech space. My company works in this space, and I wanted to share with you our latest product launch. As cooking instructors, we've spent a lot of time with home cooks and understand that they are short on time, knowledge, and confidence in the kitchen. 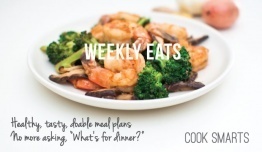 With that in mind, we set out to create Weekly Eats our new web-app that delivers healthy and tasty meal plans that fit into the busy lifestyle of anyone looking to cook more. Our app not only takes the stress out of answering the question, "What's for dinner?" it also teaches you how to cook smarter. If you'd like to learn more about the app, I'd be happy to send you a demo and some screen shots. To learn more about the community we've built, please check out our Facebook page. Let us know if there's anything we can do to help your readers live happier, simpler, smarter in the kitchen.